The article is fairly brief and only superficially addresses the problem. This very-well done video by award-winning author and Mormon historian Dan Vogel addresses many of the issues from the Church essay as well as other apologetic arguments provided by the Mormon Interpreter. Dan is probably the most knowledgeable scholar on the Book of Mormon translation process and this addresses the translation process better than anything we have seen. Many Mormons believe this is how Joseph Smith translated the Book of Mormon as he sat behind a curtain dictating the translation to a scribe on the other side. There is a good reason for this: Joseph Smith's official history implies this is how it was done. The problem is that there is not a shred of evidence supporting this claim. In fact, this image is an anachronism that reflects a later development in Smith's evolving story. Instead, eyewitness testimony confirms that Smith translated in the same manner that he once hunted for buried treasure: that is, with his brown-colored seer stone placed in the crown of his white top hat and his face snug to its brim. Rather than seeing treasures in the bowels of the earth, Smith claimed he saw luminous words on the stone, which he read to a scribe. In this manner the entire Book of Mormon as we have it came into existence. Hi I'm Dan Vogel. There has been a lot of confusion about the method Joseph Smith used to produce the Book of Mormon. The confusion is largely due to Joseph Smith's attempt to suppress the occult or folk magic (not Satanic) origins and coming forth of the Book of Mormon. Some apologists have also confused matters in an attempt to harmonize Smith's official history with eyewitness accounts, claiming that he switched between methods and simply chose to emphasize one over the other. In this video, I will attempt to reconstruct the historical events as they unfolded and hopefully clear up some of the confusion and get everyone on the same page. if he had ever discovered any thing with the plates of gold; he [Smith] said no: he then asked him to look in his stone, to see if there was any thing with them. He looked, and said there was nothing; he told him to look again, and see if there was not a large pair of specks with the plates; he looked and soon saw a pair of spectacles, the same with which Joseph says he translated the Book of Mormon. Chase's account was subsequently corroborated by early Mormon convert and Smith family friend from Colesville Joseph Knight Sr., who said Lawrence "was a seear and he had Bin to the hill and knew about the things in the hill and he was trying to obtain them." It is probable Lawrence's spectacles were ordinary and not the supernatural instrument that Smith later turned them into. They were large because it was generally held that the legendary ancient Mound Builders were a large race. While Smith obtained a second witness to the existence of the plates through Lawrence, he was nevertheless stuck with the spectacles. So when he got possession of the plates in 1827, he had to include the spectacles. The idea that Smith did not invent the spectacles but that they were forced on him explains why he quickly and inexplicably discarded them for his own stone-in-hat method. Chase's account also raises doubt about Smith's claim that the angel told him about the spectacles in 1823.
it consisted of two smooth three-cornered diamonds set in glass, and the glasses were set in silver bows, which were connected with each other in much the same way as old fashioned spectacles. Joseph Knight Sr. from Colesville was staying in the Smith home the same day Lucy says she handled the spectacles and said he had a conversation with Joseph about the instrument but did not handle it. While there was no attempt to claim the instrument buried with the plates was the same as the one used by ancient Jewish High Priests, the purpose of making such an association was to obscure the occult or folk-magic connection with seer stones. Q.—In what manner was the interpretation, or translation made known, and by whom was it written? A.—It was made known by the spirit of the Lord through the medium of the Urim and Thummim; and was written partly by Oliver Cowdery, and partly by Martin Harris. Q.—What do you mean by Urim and Thummim? A.—The same as were used by the prophets of old, which were two crystal stones, placed in bows something in the form of spectacles, which were found with the plates. Moroni, the person who deposited the plates,…appeared onto me, and told me where they were; and gave me directions how to obtain them. I obtained them, and the Urim and Thummim with them; by the means of which, I translated the plates; and thus came the Book of Mormon. there were two stones in silver bows—and these stones, fastened to a breastplate, constituted what is called the Urim and Thummim,…and the possession and use of these stones were what constituted "Seers" in ancient or former times; and that God had prepared them for the purpose of translating the book. when I got those plates…I should not show them to any person; neither the breast plate with the Urim and Thummim; only to those to whom I should be commanded to show them. With the records was found a curious instrument, which the ancients called "Urim and Thummim,"which consisted of two transparent stones set in the rim of a bow fastened to a breast plate. Through the medium of the Urim and Thummim I translated the record by the gift and power of God. He also said the Urim and Thummim was attached to the breastplate by a rod which was fastened at the outer shoulde[r] edge of the breastplate and to the end of the silver bow. This rod was just the right length so that when the Urim and thummim was removed from before the eyes it woul<d> reac<h> to a pocked [pocket?] on the left side of the breastplate where the instrument was kept when not in use by the Seer. This is the only source for the rod holding the spectacles out from the breastplate. If reported accurately, William, who had no firsthand information about the translation and admitted he "knew nothing about it…until after the organization of the Church," undoubtedly obtained these details from his brother Joseph, probably after 1838. The revelation apparently associates the breastplate with the sword of Laban, rather than the Urim and Thummim or spectacles. This revelation has undoubtedly been altered to use the term Urim and Thummim instead of spectacles or interpreters. The earliest copy of this 1829 revelation dates to about 1835. Regardless, the ordering of the Nephite relics seems to suggest that Nephi not only kept Laban's sword, but also preserved his "armor" (1 Nephi 4:19). This has serious implications for those who imagine Joseph Smith sitting behind the curtain wearing the breastplate since it appears that the meaning of the breastplate was changed to fit with the evolving story of the Urim and Thummim. This means that Joseph Smith's later descriptions of the Urim and Thummim attached to a breastplate are anachronistic to the 1828 and 1829 setting. The breastplate was part of the fiction that came with associating the spectacles with the Urim and Thummim; hence prior to this association, there was no thought of attaching the spectacles to a breastplate. With the breastplate gone, what was Joseph Smith's method of using the spectacles? What did he claim to be doing behind the curtain? The curtain was necessary because he said he was commanded to show neither the plates nor the spectacles to anyone. Prior to the story of the Urim and Thummim attached to a breastplate, it was apparently understood that Smith simply held the spectacles up to his face or somehow attached them to his head, which is what Martin Harris apparently told Professor Anthon in New York City and the Reverend Clark in Palmyra in 1828, as I will soon discuss. There are also sources that claim Smith sometimes put the spectacles in his hat like he did with his seer stone. However, these sources are of questionable authority, vague and sometimes confused, and contradict more reliable sources. Moreover, there is a distinct possibility that some reporters simply conflated the stories of Smith's translating with the spectacles and his dictating with the seer stone in his hat. None of the sources provide enough detail to determine if Smith used this method behind the curtain or in the open, or what period of the translation process it occurred. At least one apologist has endeavored to exploit this confused aspect of reporting. In an online journal—The Interpreter: A Journal of Mormon Scripture—Roger Nicholson attempted to answer the question: "How can a believing Latter-day Saint reconcile apparently conflicting accounts of the translation process?" The primary conflict to resolve is between eyewitness accounts of Joseph Smith translating with a seer stone in a hat and the official story of the spectacles attached to a breastplate. Nicholson's solution was to suggest that Smith alternated between putting the seer stone and spectacles in his hat, drawing on the vague and inaccurate secondhand reports for support. He suggested that this was not only true at the beginning when Smith was behind the curtain, but also during the entire process when he was in full view of the witnesses. Nicholson therefore argues that the contradiction between the eyewitness accounts of the stone in hat and Joseph Smith's claim of using the spectacles is only apparent and can be explained as simply a matter of shifting emphasis. I will therefore review these sources and show that Nicholson's theory is on shaky ground and ultimately fails to resolve the conflict between the official story and eyewitness testimony. A man by the name of Martin Harris was in this village a few days since…He states that after a third visit from the same spirit in a dream, he [Smith] proceeded to the spot, removed earth, and there found the bible, together with a large pair of spectacles.…The treasure consisted of a number of gold plates, about 8 inches long, 6 wide, and one eighth of an inch thick, on which were engraved hieroglyphics. By placing the spectacles in a hat and looking into it, Smith interprets the characters into the English language. It is possible that the reporter conflated the story of the spectacles and Joseph Smith's use of a seer stone in a hat. Such confusion would be understandable. Since the spectacles were buried with the plates for the purpose of translating them, it would only be natural to assume that it was the instrument Joseph Smith put into his hat. Nicholson also quotes Martin Harris's 1859 interview with spiritualist Joel Tiffany as evidence that Harris "told a consistent story" throughout his life. After recounting Harris's description of the spectacles, Tiffany quoted Harris saying: "I never dared to look into them by placing them in the hat." This account is obviously garbled since Harris was never allowed to handle either the plates or spectacles uncovered or to view them in a casual non-visionary manner. Rather than showing that Harris "told a consistent story," as Nicholson argues, it shows quite clearly that it was easy to misunderstand Harris's account of an inherently confusing story. Moreover, despite Nicholson's assertion, these accounts are inconsistent with more reliable sources, to be discussed, where Harris describes Smith using a seer stone in his hat. he [Joseph] translated them by means of the Urim and Thummim, (which he obtained with the plates), and the power of God. The manner in which this was done was by looking into the Urim and Thummim, which was placed in a hat to exclude the light, (the plates lying near by covered up), and reading off the translation, which appeared in the stone by the power of God. When Joseph received the plates he a[l]so received the Urim and Thummim, which he would place in a hat to exclude all light, and with the plates by his side he translated the characters, which were cut into the plates with some sharp instrument, into English. And thus, letter by letter, word by word, sentence by sentence, the whole book was translated. Now the way he translated was he put the urim and thummim into his hat and Darkned his Eyes then he would take a sentence and it would apper in Brite Roman Letters[.] then he would tell the writer and he would write it[.] then< that would go away> the next sentance would Come and so on[.] But if it was not Spelt rite it would not go away till it was rite[,] so we see it was marvelous[.] thus was the hol [whole] translated. Of course, the claim that the entire Book of Mormon was translated with the spectacles, either attached to a breastplate or in a hat, is incorrect and as we shall see, contradicted by the eyewitness testimonies of Emma Smith, Martin Harris, David Whitmer, and others. William Smith and Joseph Knight were not eyewitnesses and do not reveal the source of their information, so it is possible that they could have also conflated stories in an attempt to harmonize the story of the spectacles in Joseph Smith's history and eyewitness accounts of his putting the seer stone in his hat. The suggestion that Smith put the spectacles into his hat seems problematic for a number of reasons. For instance, one wonders how a large pair of spectacles—reportedly much wider than Smith's head—would be able to lay flat at the bottom of Smith's white stove-pipe hat. This method also seems inconsistent with the claimed spectacles-like quality of the instrument. Not only did Smith originally call them "spectacles," as previously discussed, but he said they"consisted of two transparent stones set in the rim of a bow." By looking at the characters on the plates "through" the spectacles, the characters magically transformed into English. Naturally, there was a need to shield Smith from the view of others while using this instrument. Because Smith's seer stone was not transparent, it did not operate the same way and had to be placed in a hat to see what was illuminated on its surface; hence, there was no need for the plates or curtain. To overcome this obvious problem, Nicholson refers to Martin Harris's description of the spectacles in his 1859 interview with Joel Tiffany, which says the stones in the spectacles were "white, like polished marble, with a few gray streaks." He then observes, "This does not necessarily imply that they were transparent." The argument he apparently tries to make is that the Nephite Interpreters did not operate by looking "through" them like spectacles but onto them like Smith did with his brown stone. Never mind the numerous more reliable sources that say otherwise, some of which come from Harris. Martin told the Reverend Clark in 1828 and Edward Stevenson in 1870 that the stones of the spectacles were "clear" and "transparent." Oliver Cowdery testified at Smith's 1830 trial in South Bainbridge that "Smith found with the plates, from which he translated his book, two transparent stones, resembling glass, set in silver bows." As a means of further assessing Nicholson's theory, I will now reconstruct the historical events as they unfolded. This young man was placed behind a curtain, in the garret of a farm house, and, being thus concealed from view, put on the spectacles occasionally, or rather, looked through one of the glasses, decyphered the characters in the book, and, having committed some of them to paper, handed copies from behind the curtain, to those who stood on the outside. A young man, it seems, had been placed in the garret of a farm-house, with a curtain before him, and, having fastened the spectacles to his head, had read several pages in the golden book, and communicated their contents in writing to certain persons stationed on the outside of the curtain. He had also copied off one page of the book in the original character, which he had in like manner handed over to those who were separated from him by the curtain, and this copy was the paper which the countryman had brought with him. Of course, it was necessary that Smith be screened from view when supposedly copying characters from the plates or translating with the spectacles. In 1880, newspaperman Frederick G. Mather reported that Smith translated "in a little low chamber" in the second story of Smith's house in Harmony, and that he was screened from view "by blankets nailed to the walls." He obtained this information from Sally McKune, who lived in the house for forty years. She reported that the "nails remained for many years just as they were driven by the Prophet, and it was not until some repairing was done a short time ago that they were drawn out." by means of the Urim and Thummim I translated some of them [characters], which I did between the time I arrived at the house of my wife's father, in the month of December, and the February following. The way that Smith made his transcripts and transcriptions for Harris was the following: Although in the same room, a thick curtain or blanket was suspended between them, and Smith concealed behind the blanket, pretended to look through his spectacles, or transparent stones, and would then write down or repeat what he saw, which, when repeated aloud, was written down by Harris, who sat on the other side of the suspended blanket. Harris was told that it would arouse the most terrible divine displeasure, if he should attempt to draw near the sacred chest, or look at Smith while engaged in the work of decyphering the mysterious characters. This was Harris' own account of the matter to me. Like Anthon's account, Clark indicates that some translating had been done from behind the curtain prior to Harris's return to Harmony in April 1828. However, as we shall see, Smith quickly switched to his more familiar stone-in-hat method. When my husband was translating the Book of Mormon, I wrote a part of it, as he dictated each sentence, word for word, and when he came to proper names he could not pronounce, or long words, he spelled them out, and while I was writing them, if I made any mistake in spelling, he would stop me and correct my spelling, although it was impossible for him to see how I was writing them down at the time. Even the word Sarah he could not pronounce at first, but had to spell it, and I would pronounce it for him. When he stopped for any purpose at any time he would, when he commenced again, begin where he left off without any hesitation, and one time while he was translating he stopped suddenly, pale as a sheet, and said, "Emma, did Jerusalem have walls around it?" When I answered, "Yes," he replied "Oh! I was afraid I had been deceived." He had such a limited knowledge of history at that time that he did not even know that Jerusalem was surrounded by walls. Clearly there was no curtain or spectacles during the major portion of Emma's tenure as scribe, the curtain and spectacles being quickly discarded in favor of Joseph's stone-in-hat method. So what are we to understand by her comment to Emma Pilgrim in 1870? Nicholson has interpreted this as meaning the spectacles were used for the entire lost 116-page manuscript except for occasional use of the seer stone, that the "timeframe for the transition from the Nephite interpreters to the seer stone…occurred after the loss of the 116 pages and upon the resumption of translation"—but clearly this was not the case. Given her own descriptions of the stone in hat during her work as scribe, she more likely meant that the occasional parts that were translated with the spectacles were among the manuscript pages that Harris lost. However, the important part of what Emma said was that the spectacles were not used after the loss of the 116 pages, which as we shall see Nicholson disputes. returned again to my house about the 12th of April, 1828, and commenced writing for me while I translated from the plates, which we continued until the 14th of June following, by which time he had written one hundred and sixteen pages of manuscript on foolscap paper. Similar to Emma, Martin Harris also described Joseph Smith translating with his seer stone in a hat. In August 1870 Edward Stevenson went to Kirtland, Ohio, and accompanied Harris to Utah. Later, Stevenson recounted some items of history he had learned from Harris, including the manner Joseph Smith translated the Book of Mormon. He [Harris] also stated that the Prophet translated a portion of the Book of Mormon, with the seer stone in his possession. The stone was placed in a hat that was used for that purpose, and with the aid of this seer stone the Prophet would read sentence by sentence as Martin wrote, and if he made any mistake the sentence would remain before the Prophet until corrected, when another sentence would appear. Harris also told a story that demonstrates that the method Harris described was the one used during his tenure as scribe. About 1870 Harris made a signed affidavit for William E. McLellin. It no longer exists, but according to McLellin it confirmed his long-held assumption that "J.S. read off the 116 pages by means of the Interpreters found with the plates, and thereafter used a small stone." This would seem to imply that the spectacles were also used during Harris's tenure as scribe and that Smith alternated between methods. However, one should not assume the alternation was between putting the spectacles or seer stone in the hat, but rather more likely between the hat and the curtain. Thus Palmyra newspaperman Abner Cole reported in 1831: "Harris declares, that when he acted as amanuenses, and wrote the translation, as Smith dictated, such was his fear of the Divine displeasure, that a screen (sheet) was suspended between the prophet and himself." In regard to Nicholson's theory, a question presents itself at this point: If Nicholson wants to believe Smith used the spectacles with the hat, why does he assume it was out in the open and not also behind the curtain? The reason is: he wants the spectacles to be used throughout the entire translation and he knows after the loss of the 116 pages "Joseph sat in the open, without a curtain, dictating to his scribe while looking into his hat." This is necessary to harmonize the accounts of Joseph Smith and Oliver Cowdery with the other eyewitnesses. These were days never to be forgotten—to sit under the sound of a voice dictated by the inspiration of heaven, awakened the utmost gratitude of this bosom! Day after day I continued, uninterrupted, to write from his mouth, as he translated, with the Urim and Thummim, or, as the Nephites would have said,"Interpreters," the history, or record, called "The book of Mormon." I wrote, with my own pen, the entire Book of Mormon (save a few pages) as it fell from the lips of the Prophet Joseph Smith, as he translated it by the gift and power of God, by the means of the Urim and Thummim, or, as it is called by that book, "Holy Interpreters." During the trial it was shown that the Book of Mormon was brought to light by the same magic power by which he pretended to tell fortunes, discover hidden treasures, &c. Oliver Cowdry, one of the three witnesses to the book, testified under oath, that said Smith found with the plates, from which he translated his book, two transparent stones, resembling glass, set in silver bows. That by looking through these, he was able to read in English, the reformed Egyptian characters, which were engraved on the plates. So much for the gift and power of God, by which Smith says he translated his book. Two transparent stones, undoubtedly of the same properties, and the gift of the same spirit as the one in which he looked to find his neighbor's goods. Cowdery's testimony was false, but who was there in 1830 to contradict him? However, the verdict of history has impeached his testimony. All the other eyewitnesses to the translation process—Martin Harris, Emma Smith, David Whitmer, and others—testify that the spectacles were not used while Cowdery served as scribe. Emma, who told Joseph III in 1879 that "Oliver Cowdery and your father wrote in the room where I was at work," specifically told Mrs. Pilgrim that the spectacles were not used after Harris lost the 116 pages. This means that there was no alternating between seer stone and spectacles, as Nicholson tries to argue. The same is true for the remainder of the translation work that occurred at the Whitmer home in Fayette, New York. When David Whitmer said "The 'Interpreters' were taken from Joseph after he allowed Martin Harris to carry away the 116 pages of Ms [manuscript]," he was testifying that the spectacles were never used during the last month of translation while Smith and Cowdery were at work in his father's cabin in Fayette, New York. The Whitmers were of German stock and lived in a small one-and-half story cabin. Emma soon moved in as well, and in the cramped quarters there was little chance for privacy—no place to escape the eyes and ears of the Whitmers. In fact, David Whitmer said he had "free access to their room," and his sister Elizabeth said she "often sat by and saw and heard them translate and write for hours." Another source reports David Whitmer saying "the translation was performed in the presence of not only the persons mentioned, but of the entire Whitmer household and several of Smith's relatives besides." The earliest account of Joseph Smith's method of translation in Fayette was given by Elizabeth Ann (Whitmer) Cowdery, younger sister of David Whitmer and Oliver Cowdery's widow. On 15 February 1870, she prepared an affidavit regarding the translation of the Book of Mormon for William E. McLellin. Richmond, Ray Co., Mo. Feb 15th 1870—I cheerfully certify that I was familiar with the manner of Joseph Smith's translating the book of Mormon. He translated the most of it at my Father's house. And I often sat by and saw and heard them translate and write for hours together. Joseph never had a curtain drawn between him and his scribe while he was translating. He would place the director in his hat, and then place [indecipherable canceled word] his <face in his> hat, so as to exclude the light, and then [read?] to his scribe the words (he said) as they appeared before him. She referred to Smith's seer stone as a "director" because it gave directions in the form of commandments and revelations. Smith used the term himself in an early revelation (D&C 3:15). With the sanction of David Whitmer, and by his authority, I now state that he does not say that Joseph Smith ever translated in his presence by aid of Urim and Thummim; but by means of one dark colored, opaque stone, called a "Seer Stone," which was placed in the crown of a hat, into which Joseph put his face, so as to exclude the external light. Then, a spiritual light would shine forth, and parchment would appear before Joseph, upon which was a line of characters from the plates, and under it, the translation in English; at least, so Joseph said. I will now give you a description of the manner in which the Book of Mormon was translated. 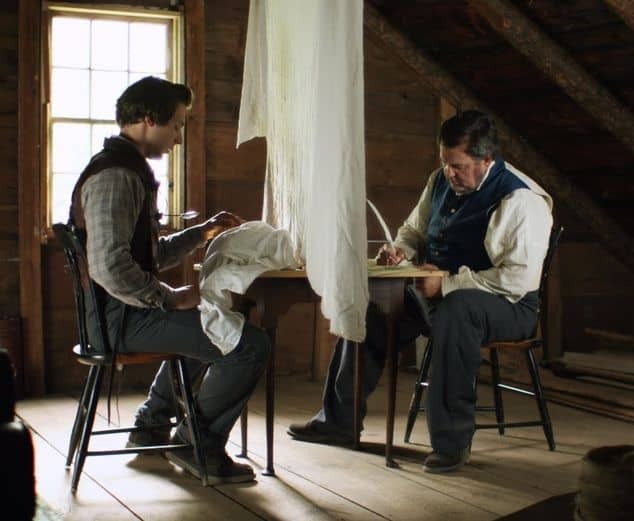 Joseph Smith would put the seer stone into a hat, and put his face in the hat, drawing it closely around his face to exclude the light; and in the darkness the spiritual light would shine. A piece of something resembling parchment would appear, and on that appeared the writing. One character at a time would appear, and under it was the interpretation in English. Brother Joseph would read off the English to Oliver Cowdery, who was his principal scribe, and when it was written down and repeated to Brother Joseph to see if it was correct, then it would disappear, and another character with the interpretation would appear. Thus the Book of Mormon was translated by the gift and power of God, and not by any power of man. He used a stone called a "Seers stone," the "Interpreters" having been taken away from him because of transgression.…The "Interpreters" were taken from Joseph after he allowed Martin Harris to carry away the 116 pages of Ms [manuscript]—of the Book of Mormon as a punishment, but he was allowed to go on and translate by the use of a "Seers stone" which he had, and which he placed in a hat into which he buried his face, stating to me and others that the original Character[s] appeared upon parchment and under it the translation in english, which [enabled him] to read it readily. Now all L.D.S.ism claims that Joseph Smith translated the Book [of Mormon] with Urim and Thummim, where he did not even have or retain the Nephite or Jaredite Interpreters, but translated the entire Book of M[ormon]. by means of a small stone. I have certificates to that effect from E[lizabeth]. A[nn]. Cowdery (Oliver's widow,) Martin Harris, and Emma Bidamon. And I have the testimony of John and David Whitmer. Except for Elizabeth Ann Cowdery's affidavit, which he quoted in a letter to his friends, these certificates are no longer extant. However, there can be little doubt that Cowdery and Smith prevaricated on the manner in which the Book of Mormon came into existence. The idea that Emma Smith and David Whitmer, both of whom said Joseph Smith did not use the spectacles after the loss of the 116 pages, were mistaken because they couldn't see what was in the hat is pure apologetic fiction. If such were the case, the witnesses would have observed Smith taking precautions to prevent them from viewing the instrument. Since Smith would have had no reason to keep his use of the spectacles from Emma and the Whitmers, Nicholson's theory has no credibility and is an obvious invention to avoid troubling evidence of Smith and Cowdery's misrepresentation. Let's summarize what we know. 1. The spectacles were not part of the story Joseph Smith told his family in 1823 but were invented by Palmyra seer Samuel Lawrence in 1825 in a game of one-upmanship. Smith got a second witness to his plates, but he was stuck with including the spectacles in his story. 2. Joseph Smith transformed Lawrence's spectacles into a special translating instrument that operated much like his seer stone. 3. At no time during the translation were the spectacles said to be attached to a breastplate, but were either held up to the face or possibly placed in a hat like the seer stone. or somehow attached to the head. 4. A curtain or blanket was used to shield Joseph Smith from view when either the plates or spectacles were said to be present. 5. Joseph Smith was shielded by a blanket when he claimed to be copying characters from the plates and performing some preliminary translating prior to Martin Harris's visit with Charles Anthon in New York City in February 1828. 6. The transition from spectacles to seer stone occurred very early in the translation process while Emma was scribe and prior to Martin Harris's return from the East and becoming Smith's main scribe in April 1828. 7. Emma was scribe for the early portion of the lost 116-page manuscript, which mentioned Lehi's wife Sariah and the walls of Jerusalem, and she testified to the head-in-hat as Smith's main method of translating during her tenure as scribe. 8. Martin Harris described both the curtain with spectacles and head-in-hat with seer stone methods for his term as scribe, which lasted from 12 April to about 14 June 1828. 9. According to Emma Smith and David Whitmer, the spectacles were never used after Martin Harris lost the 116-page manuscript and the entire Book of Mormon as we have it was translated with the seer stone in hat. 10. Both David Whitmer and his sister Elizabeth Ann testify to seeing Smith translate with a seer stone and his head in a hat and that a blanket was never used to separate Smith from the scribe, who was usually Oliver Cowdery. 11. Oliver Cowdery testified falsely at Joseph Smith's trial in South Bainbridge in July 1830 that the Book of Mormon was translated through the spectacles. Cowdery repeated this false claim in 1835 and 1848. 12. As early as 1832, Mormon apologists began comparing the spectacles to the Urim and Thummim described in the Old Testament as part of Aaron's breastplate to detract from its folk-magic context. 13. Joseph Smith's 1838 history contains several misrepresentations with regard to the translation of the Book of Mormon. A. He adopted the term Urim and Thummim to refer to the spectacles as a means of suppressing its origins in the occult. B. To make the link between the magic spectacles and the Urim and Thummim more attractive, he anachronistically claimed that the spectacles were attached to a breastplate. C. He also used the term Urim and Thummim, not as a covering term (or descriptive category) for similar instruments (as some apologists try to assert), but rather to hide the fact that he was really translating and receiving revelations with a seer stone in his hat. D. He tried to make it appear that the entire Book of Mormon was translated with the spectacles, which wasn't the case. This also led to the false impression that the entire Book of Mormon was dictated from behind a curtain. E. To maintain the claim that only the spectacles were used, he awkwardly had the Urim and Thummim taken from him in July 1828 after the loss of the 116 pages, but returned long enough to get a revelation (D&C 3), after which the instrument is again taken but given back after "a few days"along with the plates to resume translating. In reality, there was no need to have the spectacles returned briefly (by an angel who could have delivered the message himself) since he could have and probably did receive the revelation through his seer stone, which he did not want to mention. F. Suppression of the seer stone was part of a general suppression of all things magical, including the true nature and extent of his previous activities as a treasure seer and various aspects of his encounters with the angel guarding the plates. It was not intended to tell the world all the particulars of the coming forth of the Book of Mormon, & also…that it was not expedient for him to relate these things &c.
At this early date, with so many present already knowing the details, and a clerk taking notes, it was best not to alienate those from more traditional Christian backgrounds with a story designed to impress a small segment of society—which included his father and former money-digging friends. E. D. Howe, Mormonism Unvailed: or, A Faithful Account of That Singular Imposition and Delusion, from Its Rise to the Present Time (Painesville, Ohio: E. D. Howe, 1834), 243. Dan Vogel, ed., Early Mormon Documents, 5 vols. (Salt Lake City: Signature Books, 1996-2003), 2:68 (hereafter EMD). Joseph Knight, Sr., "Manuscript of the History of Joseph Smith," circa 1835-1847, LDS Church History Library, Salt Lake City (EMD 4:14-15). Lawrence, in his forties, is listed in the 1830 Palmyra census (1830:37). Lucy Smith, Biographical Sketches of Joseph Smith the Prophet, and His Progenitors for many Generations (Liverpool: S. W. Richards, 1853), 101 (EMD 1:329). Joseph Knight, Sr., "Manuscript of the History of Joseph Smith," circa 1835-1847, 2-3, LDS Church History Library, Salt Lake City (EMD 4:15). The Evening and The Morning Star 1 (July 1832): . The Evening and The Morning Star 1 (Jan. 1833): . Boston[MA] Investigator 2 (10 Aug. 1832): 2. Orson Hyde Journal, 5 Aug. 1832, LDS Church History Library, Salt Lake City. Oliver Cowdery to W. W. Phelps, 7 Sept. 1834, [Letter I], Latter Day Saints' Messenger and Advocate 1 (Oct. 1834): 14. Elders' Journal 1 (July 1838): 42-43; DHC 3:28; EMD 1:52. Joseph Smith's journal records that he worked on his answers on 8 May 1838. See Dean C. Jessee et al., The Joseph Smith Papers. Journals, Vol. 1: 1832-1839 (Salt Lake City: The Church Historian's Press, 2008), 267. Joseph Smith, History, 1832. In Joseph Smith Letterbook, 1:5, Joseph Smith Collection, LDS Church History Library, Salt Lake City. Conveniently found in EMD 1:30; Karen Lynn Davidson et al., The Joseph Smith Papers. Histories, Volume 1: Joseph Smith Histories, 1832-1844 (Salt Lake City: The Church Historian's Press, 2012), 15. Joseph Smith, Jr., et al., History of the Church of Jesus Christ of Latter-day Saints, ed. B. H. Roberts, 7 vols. 2nd ed. rev. (Salt Lake City: Deseret Book, 1948), 1:12 (hereafter DHC); Pearl of Great Price, JS 2:35. Times and Seasons 3 (1 March 1842): 707; DHC 4:537; EMD 1:171. "Statement of J. W. Peterson Concerning William Smith," 1 May 1921, Miscellaneous Letters and Papers, Community of Christ Library-Archives, Independence, MO (EMD 1:508-9). William Smith, William Smith on Mormonism(Lamoni, Iowa: Herald Steam Book and Job Office, 1883), 15 (EMD 1:499). The earliest text would have been the one copied by John Whitmer into the Book of Commandments and Revelations about March 1831, except that it was"removed at some point from the volume and is no longer extant" (Michael Hubbard MacKay, et al., The Joseph Smith Papers. Documents, Volume 1: July 1828-June 1831 [Salt Lake City: The Church Historian's Press, 2013], 82). The editors of the 1833 Book of Commandments also chose not to include it. It was first published in the Doctrine and Covenants in 1835. This same work also notes: "... use of the term 'Urim and Thummim' (rather than the Book of Mormon term'interpreters' or the term 'spectacles,' which JS used in 1829 and 1832) is probably a later redaction since 'Urim and Thummim' does not appear in JS's writings before 1833"(Ibid., 84, n. 320). Roger Nicholson, "The Spectacles, the Stone, the Hat, and the Book: A Twenty-First Century Believer's View of the Book of Mormon Translation," Interpreter: A Journal of Mormon Scripture 5 (2013): 121.Link is here..
 Apologist and General Authority B. H. Roberts also attempted to explain the apparent contradiction by suggesting that Joseph Smith alternated between the seer stone and spectacles, though his argument was less developed than Nicholson's. See B. H. Roberts, New Witnesses for God, 3 vols. (Salt Lake City: Deseret News, 1909-11), 2:106-108. "The apparent contradictions between accounts of the translation are not actually contradictions at all, and are primarily the result of certain elements of the translation process being de-emphasized, or even denied at various points during the last century and a half. The use of the Nephite interpreters as Urim and Thummim, the use of the seer stone as Urim and Thummim, and the use of the hat with both instruments, as well as the appearance and disappearance of the curtain, all ﬁt into the translation scenario at various stages of the process." Nicholson, "The Spectacles, the Stone, the Hat, and the Book ...," 186. "Golden Bible," Rochester Gem 1 (5 Sept. 1829): 70 (EMD 2:272-73). For a similar account, see "Golden Bible," Palmyra Freeman, circa Aug. 1829, as reprinted in Advertiser and Telegraph (Rochester), 31 Aug. 1829 (EMD 2:221). The mistake of conflating the story of the spectacles and eyewitness testimony of Joseph Smith placing the seer stone in hat also plagued David Whitmer. See "The Golden Tablets on Which Were Inscribed the Records of the Tribe of Nephi.…An Interview with David Whitmer, Who Helped to Make the Translation. And Who Now Holds the Original Manuscripts of the Book of Mormon. ...," Chicago Times, 7 Aug. 1875, 1 (EMD 5:21). Whitmer issued a correction through a friend in J. L. Traughber to Editor, 13 Oct. 1879, Saints' Herald 26 (15 Nov. 1879): 341 (EMD 5:59). See Nicholson, "The Spectacles, the Stone, the Hat, and the Book ...,"132. Tiffany's Monthly 5 (Aug. 1859): 166 (EMD 2:305). W. Smith, William Smith on Mormonism, 11 (EMD 1:497). "The Old Soldier's Testimony. Sermon preached by Bro. William B. Smith, in the Saints' Chapel, Detroit, Iowa, June 8th, 1884. Reported by C. E. Butterworth," Saints'Herald 31 (4 Oct. 1884): 644. Joseph Knight, Sr., "Manuscript of the History of Joseph Smith," ca. 1835-1847, 2-3, LDS Church History Library, Salt Lake City (EMD 4:17-18). Joseph Smith, Letter to John Wentworth, Times and Seasons (Nauvoo, IL) 3 (1 March 1842): 707 (EMD 1:171). See also Joseph Smith, "Latter Day Saints," in I. Daniel Rupp, He Pasa Ekklesia: An Original History of the Religious Denominations at Present Existing in the United States (Philadelphia: J. Y. Humphreys, 1844), 406 (EMD 1:185). "Mormonism—No. II," Tiffany's Monthly (Aug. 1859): 166 (EMD 2:305). One early source mentions Smith translating with a white stone, which Nicholson mistakenly believes is a reference to the spectacles: "Smith would put his face into a hat in which he had a white stone, and pretend to read from it, while his coadjutor transcribed" (Wayne County [PA] Inquirer, ca. May 1830, as reprinted in Cincinnati Advertiser and Ohio Phoenix 8 [2 June 1830]: 1; EMD 3:274). Nicholson is unaware that Smith had two seer stones at this time—the brown stone, which he obtained from Willard Chase, and a white stone, which was mentioned in the transcript of his 1826 court hearing. Arad Stowell testified that Joseph Smith "proposed looking through another stone which was white and transparent," which he held to a candle. See"A Document Discovered," Utah Christian Advocate (Salt Lake City) 3 (Jan. 1886): 1 (EMD 4:253). Compare Ether 3:1, where the brother of Jared "did molten out of a rock sixteen small stones; and they were white and clear, even as transparent glass,"which the Lord touched to make them shine in the darkness. Nicholson,"The Spectacles, the Stone, the Hat, and the Book ...," 133. John A. Clark, Letter to Dear Brethren, 24 Aug. 1840, The Episcopal Recorder (Philadelphia) 18 (5 Sept. 1840): 94 (EMD 2:262-63). Edward Stevenson to the Editor, 30 Nov. 1881, Deseret Evening News 15 (13 Dec. 1881) (EMD 2:321). [Abram W. Benton], "Mormonites," Evangelical Magazine and Gospel Advocate (Utica, NY) 2 (9 April 1831): 120 (EMD 4:97). Howe, Mormonism Unvailed, 270-71 (EMD 4:379). Charles Anthon to Thomas Winthrop Coit, 3 April 1841, Church Record (Flushing, NY) 1 (17 April 1841): 231 (EMD 4:384). [Frederick G. Mather], "The Early Mormons. Joe Smith Operates at Susquehanna," Binghamton Republican, 29 July 1880 (EMD 4:355, 358). John A. Clark, Letter to Dear Brethren, 24 August 1840, The Episcopal Recorder (Philadelphia) 18 (5 September 1840): 94 (EMD 2:268). Emma's brother Rueben evidently helped as a scribe about this time. See [Frederick G. Mather], "The Early Mormons. Joe Smith Operates at Susquehanna," Binghamton Republican, 29 July 1880 (EMD 4:355); J. Smith III, "Last Testimony of Sister Emma," Saints'Herald 26 (1 Oct. 1879): 289 (EMD 1:537). Edmund C. Briggs, "A Visit to Nauvoo in 1856," Journal of History Vol. 9 No. 2. Briggs mentioned this interview in detail in an 1884 letter to Joseph Smith III, but correctly remembered the name "Sariah" (EMD 5:120). David Whitmer also mentioned this incident in "The Golden Tablets on Which Were Inscribed the Records of the Tribe of Nephi.…An Interview with David Whitmer, Who Helped to Make the Translation. And Who Now Holds the Original Manuscripts of the Book of Mormon. …," Chicago Times, 7 Aug. 1875, 1 (EMD 5:21). Joseph Smith III, "Last Testimony of Sister Emma," Saints' Herald 26 (1 Oct. 1879): 289-90 (EMD 1:541). Emma Smith Bidamon, Letter to Emma Pilgrim, 27 March 1870, Emma Smith Papers, RLDS Church Library-Archives, Independence, MO (EMD 1:532). Published in The Return 4 (15 July 1895): 2. Roger Nicholson, "The Spectacles, the Stone, the Hat, and the Book ...,"141. Remarking on a similar statement made by David Whitmer, Nicholson states:"however, there is no way to confirm that this was actually the case" (Ibid., 175). Edward Stevenson, "The Three Witnesses to the Book of Mormon. No. III," Millennial Star 48 (21 June 1886): 389-90 (EMD 2:324). See also Edward Stevenson to the Editor, 30 Nov. 1881, Deseret Evening News 15 (13 Dec. 1881) (EMD 2:320-21). Ibid., 391 (EMD 2:324). See also Edward Stevenson to the Editor, 30 Nov.1881, Deseret Evening News 15 (13 Dec. 1881) (EMD 2:320-21). In describing Smith's method of translating during Harris's time as scribe, Isaac Hale said: "The manner in which he pretended to read and interpret, was the same as when he looked for the money-diggers, with the stone in his hat, and his hat over his face, while the Book of Plates were at the same time hid in the woods! "("Mormonism," Susquehanna Register, and Northern Pennsylvanian 9 (1 May 1834): 1; EMD 4:287). William E. McLellin to Joseph Smith III, Independence, MO, July 1872, Community of Christ Library-Archives, Independence, MO, as transcribed in Stan Larson and Samuel J. Passey, eds., The William E. McLellin Papers, 1854-1880 (Salt Lake City: Signature Books, 2007), 516. "Gold Bible, No. 6," Palmyra Reflector (19 March 1831) (EMD 2:248). Nicholson, "The Spectacles, the Stone, the Hat, and the Book ...,"168. Oliver Cowdery to W. W. Phelps, 7 Sept. 1834, [Letter I], Latter Day Saints' Messenger and Advocate 1 (Oct. 1834): 14 (EMD 2:419). Reuben Miller, "Last Days of Oliver Cowdery," Deseret News 9 (13 April 1859) (EMD 2:495); and Reuben Miller, Journal, 21 Oct. 1848, 1:, LDS Church History Library, Salt Lake City (EMD 2:494). Joseph Smith III, "Last Testimony of Sister Emma," Saints' Herald 26 (1 Oct. 1879): 290 (EMD 1:542). "In fact, given the consistent reports of the use of the hat during translation, it is not possible to know with certainty whether Joseph was using the Nephite interpreters or the seer stone in the hat during this period of time" (Nicholson, "The Spectacles, the Stone, the Hat, and the Book ...," 147). "Copy—Questions asked of David Whitmer at his home in Richmond[,] Ray County[,] Mo—Jan 14—1885. relating to Book of Mormon, and the history of the Church of Jesus Christ of L.D.S. by Elder Z[enas] H. Gurley," Zenas Gurley Collection, LDS Church History Library, Salt Lake City (EMD 5:138). "The Golden Tablets on Which Were Inscribed the Records of the Tribe of Nephi.…An Interview with David Whitmer, Who Helped to Make the Translation. And Who Now Holds the Original Manuscripts of the Book of Mormon. ...," Chicago Times, 7 Aug. 1875, 1 (EMD 5:21). William E. McLellin to "My Dear Friends," Feb. 1870, Miscellaneous Letters and Papers, Community of Christ Library-Archives, Independence, MO (EMD 5:260). "The Book of Mormon. David Whitmer, the Associate of Joseph Smith, Now on His Death-Bed. He Describes the Translation of the Golden Tablets at Which He Assisted. The Angel in the Pasture--His Hatred of Polygamy—His Services in the Church," Chicago Tribune, 17 Dec. 1885, 3; reprinted in the Deseret Evening News 19 (24 Dec. 1885); and Saints'Herald 33 (2 Jan. 1886): 12-14 (EMD 5:153). As quoted in William E. McLellin to "My Dear Friends," Feb. 1870, Miscellaneous Letters and Papers, Community of Christ Library-Archives, Independence, MO (EMD 5:260). Original affidavit not extant. "For thou hast suffered the counsel of thy director to be trampled upon from the beginning" (D&C 3:15). Interestingly, the earliest copy of the revelations reads "directors" with "s" crossed out possibly by John Whitmer or Oliver Cowdery, who made other corrections in the same revelation. See Robin Scott Jensen, Robert J. Woodford, and Steven C. Harper, eds., The Joseph Smith Papers: Revelations and Translations, Manuscript Revelation Books. Facsimile Edition(Salt Lake City: The Church Historian's Press, 2009), 11. Wilhelm Ritter von Wymetal, Joseph Smith, the Prophet, His Family and His Friends (Salt Lake City: Tribune Printing and Publishing Co., 1986), 190. J. L. Traughber to Editor, 13 Oct. 1879, Saints'Herald 26 (15 Nov. 1879): 341 (EMD 5:59). David Whitmer, An Address to All Believers in Christ (Richmond, MO: David Whitmer, 1887), 10-11, 12 (EMD 5:196-97). "Copy—Questions asked of David Whitmer at his home in Richmond[,] Ray County[,] Mo—Jan 14—1885. relating to Book of Mormon, and the history of the Church of Jesus Christ of L.D.S. by Elder Z[enas] H. Gurley," Zenas Gurley Collection, LDS Church History Library, Salt Lake City (EMD 5:138). Document damaged; "enabled him" supplied from Autumn Leaves5 (1892): 453. William E. McLellin to Joseph Smith III, Independence, MO, July 1872, Community of Christ Library-Archives, Independence, MO, as transcribed in Stan Larson and Samuel J. Passey, eds., The William E. McLellin Papers, 1854-1880 (Salt Lake City: Signature Books, 2007), 492; also 391, 516. Nicholson asserts incorrectly and without evidence: "When the term Urim and Thummim was introduced in 1833, it did not refer uniquely to the instrument that Joseph recovered with the plates, but also referred to Joseph's own seer stone.…Only those familiar with the sources will realize that there was more than one translation instrument. The term Urim and Thummim referred to any instrument use for the purpose of translation or the receipt of revelation.…Moreover, Nicholson argues, since both instruments were referred to as "Urim and Thummim," Joseph Smith wasn't deceptive but "did indeed translate the entire Book of Mormon using the Urim and Thummim" (Nicholson, "The Spectacles, the Stone, the Hat, and the Book ...," 148, 188). Donald Q. Cannon and Lyndon W. Cook, Far West Record: Minutes of the Church of Jesus Christ of Latter-day Saints, 1830-1844(Salt Lake City: Deseret Book Co., 1983), 23. For a pretty thorough discussion of the issues surrounding the translation process of the Book of Mormon and why this is a problem and for many details not mentioned previously, please see MormonThink's section on the Book of Mormon Translation. This also Includes a link to an interesting debate with Mormon apologists on the Urim & Thummim. The essay completely glosses over the fundamental question of this seer stone - Did the seer stone have any special abilities of was it just a stone? The essay implies that this stone had some sort of power. The essay neglects to say that it was found some 24 feet underground on Mason Chase's property when Joseph and his brother Hyrum were digging a well for Mr. Chase. So why would this stone unearthed on Mr. Chase's property have any special seering abilities? It was not given to Joseph by the angel. It was not in the stone box with the plates. There is no evidence it was used anciently by the Nephite prophets. So why would this ordinary rock have any special abilities whatsoever? Why didn't the Church openly talk about this stone for nearly two centuries? How many members knew about it growing up or even know about it now? How many converts are taught this before joining the Church? Is the 'stone in the hat' method shown in any of the Visitor's Centers? Do missionaries talk about it when teaching the coming forth of the BOM? This is the stone Joseph put in a hat and looked at to bring forth the Book of Mormon! In 2006, the LDS Church had a special display at their Church Museum of different Joseph Smith artifacts. They had a mock-up of the gold plates but they chose not to display any of Joseph Smith's seer stones. Since one of these stones was used to translate all of the published Book of Mormon, one wonders why it wasn't included in the display. Was there something embarrassing about having the Book of Mormon translated through the use of this stone? Imagine what would happen if the current prophet of the Church said he was a scryer, and that he looked in a crystal ball or put his face in a hat looking at a stone to receive revelation for the Church. Members would find this troubling, let alone how it would affect the missionary work. However, if it was acceptable for the founding prophet of Mormonism to receive revelations through scrying, why doesn't the current prophet use Joseph Smith's very stone (currently in the Church's vaults) to receive revelation today? If this stone indeed has special powers it could be examined and shown to the world as a truly sacred object and used by modern-day prophets instead of hidden away. However, I think that even the most faithful member would know that this stone is just a stone and if it was examined by geologists, we have little doubt that it would be proven to be a regular stone that is commonly found in the New York area in which Joseph lived. Update: The Church did publish an article called 'Joseph the Seer' in the October 2015 Ensign that showed a picture of the actual seer stone Joseph used. Why did they not do this before now any time in the last 185 years? The essay said that "Joseph Smith, like others in his day, used a seer stone to look for lost objects and buried treasure". What they neglect to say is that Joseph never found any treasure. So why would the stone fail to find treasure but would miraculously work as a translating device? Why have the plates in the first place? If the gold plates were not even used to translate the Book of Mormon then why did the Lord have the Nephites go through all the trouble of making plates for 1,000 years when it wasn't necessary? It also raises the strange question, what in the world are the plates for? Why do we need them on the table if they are just wrapped up into a cloth while he looks into a seer stone?" The reason that 99% of the member believe that Joseph used the Urim & Thummim in conjunction with the plates to produce the Book of Mormon is because of the numerous images, paintings and depictions of Joseph actually using the gold plates to translate the BOM. Now that this essay has 'come clean' with the actual method, why doesn't the Church abandon using those old images and instead show Joseph with his face in the hat as he dictated the Book of Mormon to a scribe? So I think we should just stop that immediately. I am not sure we need a lot of pictures of Joseph looking into his hat, but we certainly should tell our children that is how it worked. It's weird. It's a weird picture. It implies it's like darkening a room when we show slides. It implies that there is an image appearing in that stone and the light would make it more difficult to see that image. So, that implies a translation that's a reading and so gives a little clue about the whole translation process. Until this happens, most members will still continue to believe that Joseph actually used the Urim & Thummim along with the actual gold plates to translate the Book of Mormon. Is this the kind of dishonesty that God's one, true, church should represent? What are investigators now taught if asked about the method? The essay does briefly mention the stone in the hat but utterly fails in any meaningful discussion of the seer stones used by Joseph and the numerous issues involved in the translation process of the Book of Mormon as brought up by critics of the Church. It is also apparent that over the last 100 years the Church has not been forthright about the stone in the hat method as it is far less believable than the Sunday School 'Urim & Thummim' narrative the Church uses to give it an air of Biblical authority. The Essay will not even reach many members as it is buried so deep in the Church's website, it is not discussed at all in General Conference talks, it is not discussed in current Church publications and the depictions in the Ensign continue to show the 'traditionally-taught' and more-believable method of Joseph actually using the gold plates in the Book of Mormon translation. When the Church prints accurate images of Joseph translating the plates using a stone in a hat then they can start to claim they have begun educating its members about the translation process, not this weak essay.